I don’t like wasting things especially something as delicious as the cherry-flavored pound cake I made for the Hidden Heart Valentine’s Pound Cake in my most recent blog post. After cutting out the brilliant fuchsia hearts for the middle of the pound cake I found myself with a heap of scrap pound cake on my hands. And though it was whittled down quickly by family drive-by nibbling, it felt to me to deserve a grander destiny! 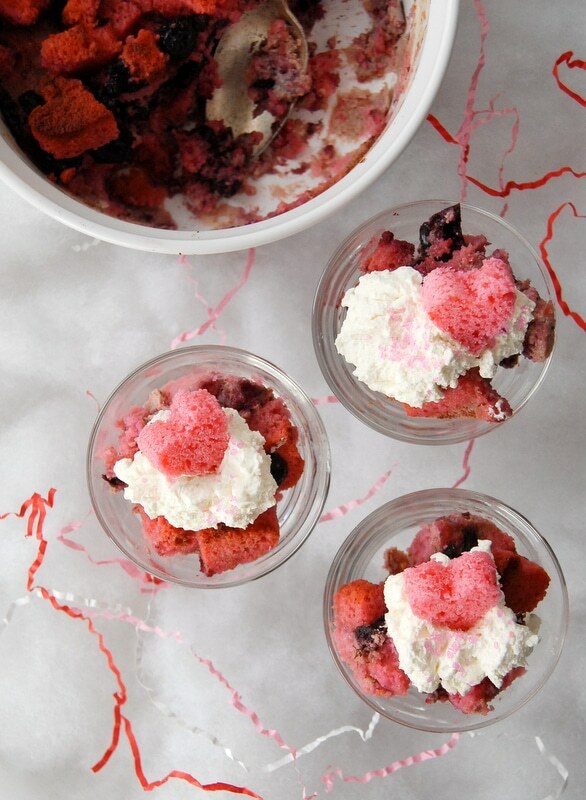 Winter is the time of year for stick-to-your-ribs desserts. Rustic fare that is filling, warming and bursting with earthier, lingering flavors. Bread pudding is a perfect match for the season often featuring plumped raisins, cinnamon and nuts. 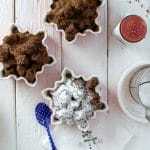 It is so easy to whip up, to adapt and is particularly hospitable to leftover bread or muffins. It does so in such a way to give new life to a bread product often on the downslide to being too hard or stale for anything but the compost pile. 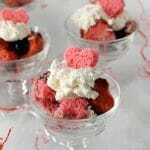 In the case of the cherry pound cake, it was still in its prime and would transform beautifully into this different and equally enticing dessert. Coupled with some actual cherries and seasonal cinnamon it is reborn into a rich, creamy, soul-satisfying treat made festive for the Valentine’s season. An unexpected confection but one whose buttery embrace is sure to please! 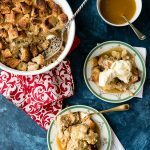 If you have not enjoyed bread pudding it is not what most would picture as a ‘pudding’ in the Bill Cosby vernacular, the pudding similar to current day mousse (a dairy-based, creamy, gelled dessert). Bread pudding combines bread and a light custard mixture to be baked in a water bath softening and melding the bread into a type of custard itself but one whose vestiges of bread still are present. 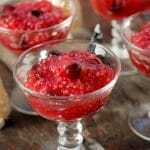 It’s not a prissy dessert by any means but rather a comfort food through and through. 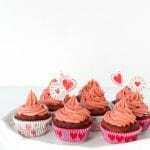 And certainly a happy-making one in pink with little hearts as in this holiday version! 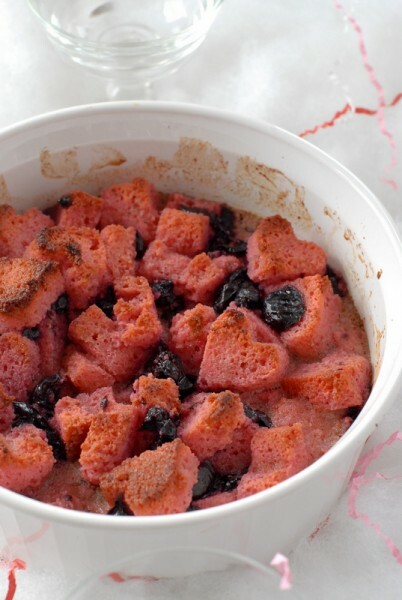 Bread pudding is simple, rustic, comfort food made Valentine's festive with cherry pound cake and cut outs with a minature heart cookie cutter. Easy to tailor to any dietary needs based on the pound cake recipe or mix you select! 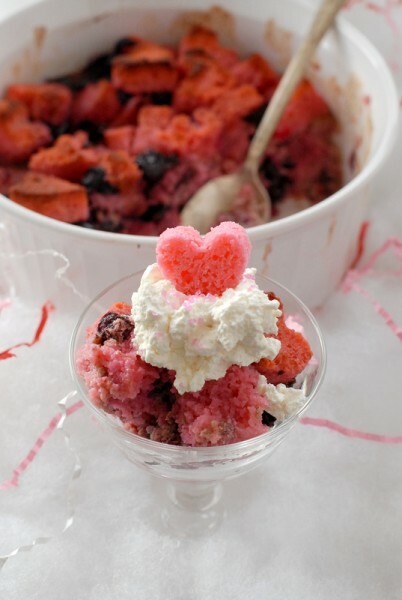 Garnish suggestions: Reserve pound cake hearts (if using 1 inch cookie cutter to cut out pound cake), freshly whipped cream and pink sprinkles. Preheat oven to 350 degrees. Butter a 2 quart casserole or soufflé dish. Set aside. In a mixing bowl whisk together sugar, cinnamon, salt and the eggs. Set aside. In a medium saucepan melt the butter over medium heat. Add the buttermilk and whisk to mix together. Allow mixture to heat until small bubbles form on the surface, stirring often. Pour sugar-egg mixture into the butter-buttermilk, reduce heat to low; stir constantly to combine and allow to thicken (about 5 minutes). Note: keep heat low so as to not scramble the eggs. Toss chopped cherries with pound cake. Spoon into prepared pan. Pour heated custard over the pound cake and cherries to cover. Place casserole in a 13 by 9 inch rectangular baking dish and fill with water (should be 1 inch deep). Place baking dish with casserole into the heated oven and cook for 40-45 minutes, uncovered. 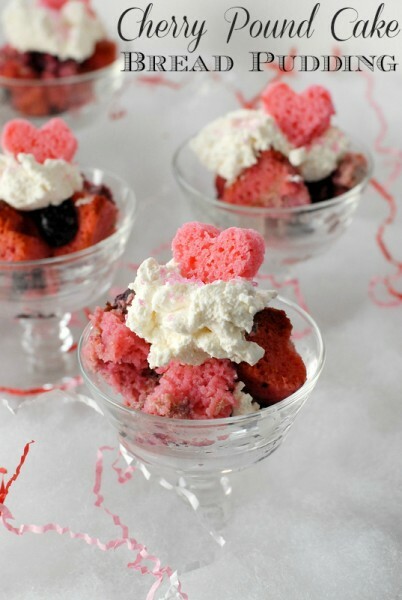 *A shortcut modification: Should you not have cherry pound cake scraps from making the Hidden Heart Valentine’s Pound Cake or not wish to bake a cherry-flavored pound cake to make the bread pudding, you can substitute a regular pound cake (store bought or homemade), and add cherry flavoring to the custard (add by ½ teaspoons until reaching the desired flavor). 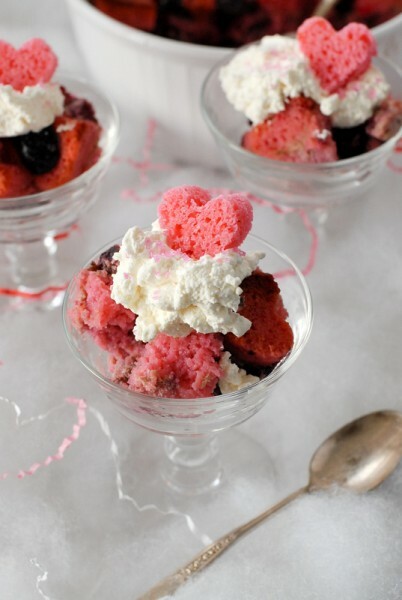 You can even add food coloring to the custard to include the lovely pink tone! Holy crap. This is GORGEOUS! I feel sure she’d love it!